I notice that even if I send accept-encoding=gzip the response does not seem to be compressed. ( it is late and i was conflating 'accept' with 'accept-encoding') Should we expect, in the 1.0 timeframe to be getting gzipped responses and therefore expect to need to set that header? I would like to know in order to make some design decisions. Kevin, here is some data for consideration in response to your response. From Silverlight ClientHttpRequest which does not actually allow setting the accept-encoding header and does not support gzip. I was mistaken in the details of my initial report as I was setting the 'accept' header, not accept-encoding (this is not supported by silverlight). But the end result is that I am not sending (not able to send) 'accept-encoding=gzip' and I am getting uncompressed responses from the server. This, while ultimately not what we want, is the correct result. The issue I am having is that using the browser stack in silverlight will enable gzip but is crippled in every other area and is sub-optimal to say the least. Using the .net stack enables, amongst other critical functionality, parsing of the rate limit headers. This is a known issue in SL3 and is not to change. I am not sure about SL4, I haven't dug deep enough yet. And regarding 'you can't get a response that isn't compressed; you can only choose between gzip & deflate' - the sessions above disagree, and rightly so. If the server was to disregard accept-encoding headers and force compression it would simply 'break the internet'. So I guess we can chalk this question up as a head's up that SL3 clients are likely to be pulling text. I am going to spend (likely waste) some time working with the browser stack and try to get an acceptable implementation going but I don't have high hopes. Groggy me, making a lot of noise but saying little: The reason that I have to use the ClientHttp stack is that the api has no crossdomain policy file and the BrowserHttp stack fails. So, I guess the question can evolve to "Is there a reason that a cross domain policy file is not present?" Silverlight thinks that flash's crossdomain.xml format is yummy. 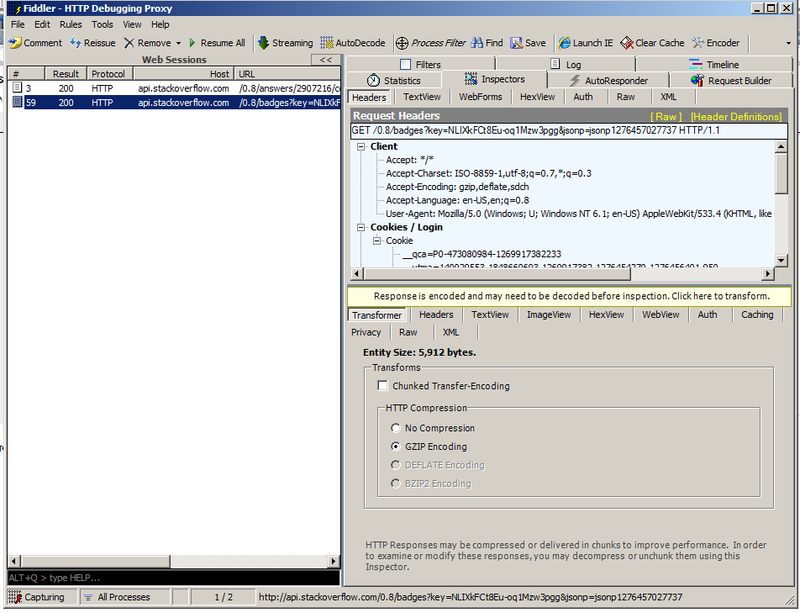 ClientHttpWebRequest does NOT request nor accept compressed response. Note the 'Transforms' UI. Used fiddler to double-check* this. Everything I get back from the API is definitely gzip compressed. For that matter, you can't get a response that isn't compressed; you can only choose between gzip & deflate. Default is gzip. The API always sets the Content-Encoding response header, so you might be the victim of your library decompressing the response for you. *Triple-checked: I ran our test cases without setting Accept-Encoding but leaving the gzip decompression code in. This is a quite old question, but just to be 100% clear. The API always responds with gzip'd content. There are cross policy domain files on the API, StackAuth, and sstatic for Flash and Silverlight. Not the answer you're looking for? Browse other questions tagged support status-completed api .